Q: Monisha, can we start with you? Congratulations on the points in Brazil. Describe the emotions and the reaction within the team? 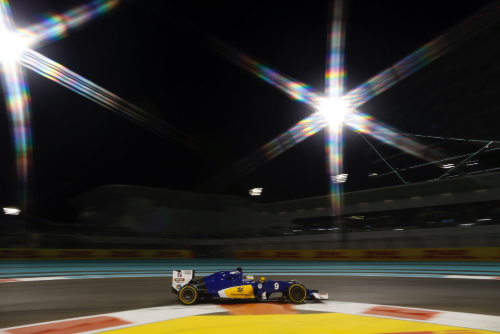 Monisha KALTENBORN: Well of course it was very relieving considering that it was a long race. You didn't know are we really going to make it to the end with the points, because you could see how Manor was right behind us and it was so important that the car stays in the race and we could see other cars coming, overtaking us. Yeah, it was a bit of a nightmare. We were all extremely relieved. They are so important for all of us, these points. It's not only financially, which of course plays a role, but also of course for the morale of the team. We didn't want to end the season again like we did in 2014. So it was extremely relieving on the track and of course at home as well. Q: We had your driver Felipe Nasr, who of course delivered those two points, in the press conference yesterday. He says he hopes it'll swing things his way. If you do confirm that 10th place in Sunday what does it do for his chances? Kaltenborn: Well, there is no direct link there you know. We have our options, we are looking at them and we know Felipe very well. We're just going to continue our assessment and when we're ready we'll announce. Q: OK, thank you. Stephen, coming to you, welcome to your first FIA Press Conference. You rescued Manor a couple of years ago from administration, what has team ownership been like in the interim? Stephen FITZPATRICK: I can recommend it to anyone. It's been a fascinating two years. It has been exhilarating, races like Bahrain this year, obviously Austria and then Brazil. So lots of ups and downs. But also humbling I would say. Coming into this sport as a beginner let's say, but as a lifelong fan, but new to the inside of the sport, you don't quite appreciate just how many things you need to get right to bring two cars home at the end of a race and I've learned a lot about just how difficult it is to build a car, to race the car, to put the team together. So I would say I'm full of respect for the people around me in the sport, the other teams, the other team principals. It's been a huge challenge, but also a little bit frustrating. One of the things that makes sport great is the belief that anything can happen and we didn't come into the sport, or I didn't come into the sport believing that we would win races or be on the podium in our first couple of years but to be in a sport like F1 you have to believe that incredible can happen and one of the challenges we have at the moment is that that sport has become very predictable. It's a problem for all of us here, even Toto - who's winning almost too much - and maybe it's even becoming a problem for him. I think that's one of the big frustrations and I think it's clear that it takes a long time to build a great F1 team. We've made a big step forward from 2015 to 2016 but there's a lot of work still to do clearly. Q: There are some stories in the press this week about your team being sold and you CEO appears to have confirmed it. What can you tell us about that? Fitzpatrick: Well, I can't talk too much about the specifics but we have been in discussions with several investors, well, for the last six months let's say. One of the things I was quite clear on, right from the start, was that I accepted that in the current F1, money equals performance, so anything that was going to bring more funding to the team and help the team develop and progress I was very open and if that meant bringing another investor, even a majority investor, hat was something I was happy to do. We have agreed terms with an investor at the moment and we are still working through that and I can't really talk more about the specifics. Q: Thank you for that. Otmar, coming to you, another championship dogfight going on a bit further up the grid involving you. It's looking good for beating Claire's team to P4. How have you done it? Otmar SZAFNAUER: Well, we're not there yet. We've got this weekend to go and we'll work hard, as we usually do, to perform to the best of our ability and hopefully that will result in fourth place. That's what we're shooting for. But the building blocks have been put in place for the last five or six years, it's not something that happens overnight. We've been working towards having a better team and a more performant car for a good six years and there's a lot that goes in it: good decision-making; having the right tools and the right people, having the right engine partner - thanks for that, Toto - but also understanding the tyres, aerodynamically efficient car. You've got to do all those things and then the performance comes. Not to mention two good drivers. Q: Esteban Ocon joins you next year. It's been a while since you've had a young driver, a relative rookie in fact. What are your expectations and why did you go for him over other candidates? Szafnauer: Well, we deliberated long and hard. We know Esteban and that helps. We ran him in two different tests and we were impressed with both his speed and his ability to learn, and also with his attitude to racing and his attitude towards learning and we thought he was a good fit for us and that's why we chose him over some of the others. Q: Thanks for that. Claire, you've not been at a race for a while, we understand that you have been with your father. How is Frank? Claire WILLIAMS: He is good now, thank you. He is on the mend. It's nice to be back at the track. Q: As we were just hearing from Otmar, it's beginning to look like P4 is slipping away from you. How did that happen from your side? Williams: I don't think we've delivered where we needed to deliver this year, across a number of key elements. I'm not going to go into detail on the areas of weakness we have in the team this year, but we know where those weaknesses are and we just need to make sure that we improve upon those areas over the winter. But Force India have done a fantastic job. You asked him where they are where they are and they have just done a better job than we have and we need to look into that. We don't want to finish fifth in the world championship. It's a bit of a disappointment having come third in two consecutive seasons, in 2014 and 2015. We just need to do a better job. Q: With that in mind, tell us about your expectations for Lance Stroll, he'll be joining you next year, he'll be 18. After all for Williams to compete for third, fourth place in the championship, he's going to have score a lot of points? Williams: Yeah, he is. The Constructors' Championship is really important for us at Williams and we need to have two strong drivers in our car. Obviously off the back of Felipe's decision to retire we had a number of options available to us. Lance has been part of a development programme that we've run since about this time last year and I think that he's absolutely proved that he has the credentials to come into Formula One next year and we're delighted that we were able to make that decision. He has dominated in F3 this year and he's won the F4 championship. He's absolutely got the talent, we feel. As with any rookie when they come into Formula One you've got to give them a bit of slack in the beginning but we are going to have high expectations of him next year, but anyone that has meet Lance knows and understands that he deserves that promotion into Formula One and he's extremely intelligent, he's a very quick learner, we've learned that through the work that we have done with him in the '3-to-1' programme, and he's incredibly charming and I think he's going to be a great addition to the paddock next year. I think it's nice to see... as much as it's sad to be losing a couple of the Formula One legend drivers that we have I think it's going to be really exciting next year to have a number of rookies lining up on the grid. Q: Ok thank you. Toto, you win too much! For the second time in three years your drivers have a title showdown here in Abu Dhabi. How do you assess their mindset and I'd be interested to know how does it differ from the first time they were in this position back in 2014? How have they matured and matured in relation to each other, in their mindset and what you see this weekend? Toto WOLFF: Obviously the longer you work with each other the better you get to know each other and it's the third season that we have had a car that was able to win races and win championships. I said it before, that in the last couple of races we had a great amount of serene... almost a serene environment. Very good for the team because they have worked together to make the car faster. Very productive and then it was very good for the dynamics within the team. Although, I must say that the championship was getting tougher and tougher for both of them. It was clear that they would be the greatest rivals for winning the Drivers' title and we've seen that this weekend is somehow a bit different; you can see that there is pressure coming up, which I guess is pretty normal at this stage of the season. Q: Red Bull looked fast this afternoon and earlier on in the long runs, but I'm interested, has the gap really closed up at the back end of the season or have you just done enough to keep everybody at arm's length? Wolff: We have seen over the last couple of races that the gaps between us and Red Bull and Ferrari have stayed pretty stable, for the simple reason that everybody must have switched off development of the 2016 car. Not all at the same time, there will have been teams that have done it sooner than others, but what you see now in terms of performances gaps or the difference in performance gap, is that somebody just gets it right on a particular track with a set of tyres, but generally it's been on a similar level for the last, I would say, four or five races. Q: (Andrea Cremonesi - La Gazzetta Dello Sport): Toto, you know what Lewis said here in the press conference yesterday about the mechanics, the book and so on. I would like to have your comment and that you don't have any regret over that decision at the beginning of the season? Wolff: You know it's always dangerous because there is one statement that is being picked out from a press conference between the two of them and as I said before I find it very remarkable how they've managed the relationship between the two of them for the benefit of the team, taking into consideration that it must be very intense and very high pressure for them. So that one comment was taken out and it is clear that if you change a crew that is directly involved with a drivers, such as mechanics or a number one that a driver constantly looks at when he's pulling out of the garage, it can have a psychological effect and we acknowledged that and it was part of our thinking when we shuffled it around. But as a matter of fact we are 1,500 people in Brixworth and Brackley and it's about developing personnel. Somebody who was working on one corner of the car today as a mechanic might be a number one next year, might be a chief mechanic afterwards and maybe has even more potential within the organisation. In a similar way we have done all through the organisation we are not keeping it static. It's a dynamic structure and the same happens in the garage. This is a fact. I appreciate the effect on the singular driver and it was taken into consideration and maybe I'll write a book in 10 years and we'll put some things in there. Q: (Ysef Harding) To follow up on that question Toto. Isn't it important to keep your number one satisfied and to give him the best of everything he needs to be successful - especially in the beginning of the season when he was aiming for a fourth world championship? Wolff: It's very important. It is, in terms of keeping the performance up in the team, you need to consider what your high-performance need; what kind of environment they need, what kind of framework they need in order to perform best. And we've considered that. And there is not just one position like the chief mechanic that is important for the performance of the team and the drivers but we have to take decisions for many, many hundreds of people and develop them. It is our duty and obligation towards these 1500 people and the great brand to take the right decisions and not one single individual - although taking into mind what is important for the driver itself. What you are seeing here on the race track is the tip of the iceberg. And by the sheer nature there is a large block underneath that brings performance and has brought the team to where we are today. And part of that is to have the most effective organisation. Not only today but also tomorrow - and that is just part of the normal procedure. Q: But if you knew that was going to psychologically affect your number one driver, why would you make that decision? Wolff: I've explained it to you already once before that weekend. There's 1500 and we need to take care that these 1500 perform well. Not one. 1500. Q: (Jerome Pugmire - AP) Question for Toto. You said that the pressure is coming up. Just speaking about Nico, do you think that this season he's been able to deal with pressure better and perhaps he's a bit more focussed and blocking things out more than he was in the previous two campaigns? Wolff: Yes, he deals with it very well and there is nothing that somehow affects him. This is at least my impression. Whether it's a difficult weekend, he has learned to assess it in the right way at the right time and move on - or whether it's a good weekend, to stay humble, both feet on the ground and try to understand why that was. Whether spirits are high or spirits are down it was all pretty stable with him - and certainly, as far as I can see, that is one of the keys why he's leading the championship today. Q: (Dieter Rencken) Stephen, the Brazilian Grand Prix was obviously from a personal perspective, your own perspective, rather disappointing. Can you try and tell us exactly how you felt when you realised that the cost of this could possibly run to $13 or $15million and potentially even more in the longer term? Fitzpatrick: Yeah, I think the first reaction wasn't really a financial one. It would have been a very exciting race and coming to the end of what was an exhilarating season, lots of ups and downs. We had held tenth place for, I think, ten races, Brazil was number ten and at many points during the race there were lots of different scenarios and there was a lot of furious calculations about finishing the race at different points throughout. The first reaction I had was one of real disappointment for the team. I think they've worked incredibly hard for the last, let's say, 18 months since the start of last season without much reward and it looked like we were heading for a tenth-place finish which was a big step forward for us. So one of immediate disappointment for the team who worked so hard all year back at the factory and here on the circuit. But my next reaction was actually one of... I thought of the opposite feeling that must be going on in the Sauber garage and I thought that the guys in the Sauber team had been fantastic competitors for us all year, we'd enjoyed a great battle with them and I knew how much those points meant to the Sauber team and I was trying to imagine the joy they would be having and they worked so hard all season to bring it back in the end. So in the end I think the season doesn't come down to one race. Obviously the way the points are structured that was a critical race for us. Very unexpected. But that's racing. On that day it didn't go our way but I think we all want to see more of that unpredictability, that excitement. So, in the end, it was a difficult night, let's say, and then back to business. Q: (Graham Harris) Question for Stephen again, and Monisha. Monisha, potentially for you, you could have tenth place locked in at the end of the season. Both teams, Monisha, you've got a new investor on-board already, Stephen you potential have a new investor on-board. Does the swapping of positions have any influence on the business decisions made. Obviously it's more attractive for you Monisha but Stephen, does that put your deal in any particular jeopardy or is it going to hurt you financially? Things planned that you can't do? Fitzpatrick: It doesn't help financially but the terms of our agreement have been... refinalised, let's say. It was clear that in tenth place with one point on the board, two races left, that there are lots of scenarios and you plan for those in advance, so, from my point of view it's disappointing but it's not unexpected - or at least not a surprise. Fitzpatrick: Not a deal-breaker. And, most importantly, we're not finished yet. We're looking good today, at least, on Friday, so we've still got one race left. Kaltenborn: Well, in our case, the investors came in at a time when we were on P11, so the risks were very well known. So the risks were very well known. And of course we said we are going to do all we can to actually still get to P10. So, it looks better if you end the season, of course, on P10, that's clear - but there's not any other impact. Q: [off-mic follow-up] adding more staff? Kaltenborn: Well no. As I said, with the investors we have, our future is secured. There's nothing out there that would cause us any dramas like in the past - but you simply look better if you have our business case and if you have that additional funding it's just easier to achieve what you want in your business case. Q: (Rene Hofmann - Suddeutsche Zeitung) I wanted to ask all five of you, concerning the upcoming season: what the rule changes mean for your particular team, what are your hopes, what the challenges you're facing? Szafnauer: Well, for a team like ours it's a big challenge, starting over without any carryover parts whatsoever has a massive impact on us - so it's a big challenge. We also don't have some of the infrastructure in place of the bigger teams. We source a lot of our parts to suppliers; we don't make them ourselves - so that adds extra time. So yeah, it's a big challenge. Our hopes are we've done a good job and others have screwed-up! Williams: We hope the same! That everyone else has screwed-up as well. No, y'know, for us, fortunately we're in quite a comfortable financial position at the moment and with the regulations coming out when they did, we were able to start development work on next year's car pretty early but that's not to say we know where our performance is. Nobody does until we get to the first test and probably not until we get to the first few races where we know where everybody shakes out. But I think it presents a great opportunity for Formula One to potentially shake up the order. I hope that we've found something spectacular over the winter. I know that the guys back at the factory have worked really hard on next year's car to try and find that performance and improve upon where we finish this year's championship next year. But I think we just have to wait and see. For the sport, I think it's pretty exciting. Kaltenborn: Well, we share that hope as well. We know that we have to take a very big step ahead so we see these rule changes as an opportunity because we want to be back next year in the midfield and we now also have the means to do that. Overall, we do hope that it's going to make the sport exciting. I think everyone's been quite critical about certain things which have been introduced so let's just hope and see if it really mixes up the grid and we have something different next year. Fitzpatrick: Well, interestingly in 2016 we had to build a completely new car: Manor didn't build a 2015 car because of the administration, so we feel that we've been through this already. There was such a big gap between where we were in 2014 and the other teams this year, so we've had to make that big step already. I gave the team quite clear instructions this year they were to focus as much of their efforts as possibly on the 2016 programme until we were able to put some points on the board and try to secure tenth place. From Austria onwards the team have been working exclusively on the 2017 programme, so there's been a lot of work gone in. We've really built up the resources of the team this year, we've moved to a great new facility; the wind tunnel facility at Mercedes and that's led to a big step forwards in our aerodynamic development. So the team are hopeful. The thing I guess I'm not really hoping for is that everyone else has screwed-up, because like I said, I've developed a lot of respect for all the other teams and I think that might be too much to hope for. It's certainly going to be a very interesting 2017 season. Q: Toto, you pick up where you left off do you, next year? Wolff: Yeah, I tend to go with Otmar! Honestly, we weren't big supporters of a regulation change. Not because we wanted to freeze the current situation. It's clear that when regulations stay stable that eventually performance is going to converge. But because we weren't sure that it is the right way for Formula One. But as it is, we are where we are and the cars, certainly in the wind tunnel, look very spectacular, very wide with the big tyres and I am personally very excited to see them on track for the first time. For the drivers it will be much harder; the cars will be pulling more g through the corners. The simulations that we have seen are very exciting. The corners will be flat that are far from flat today - and we will be breaking records in terms of lap time. So, I guess, an exciting season that will be ahead of us. I hope that overtaking is not going to be too difficult because of the width of the car and the dirty air behind it - but let's see. In hindsight, now that we are where we are, we have to do the best out of it. Q: (Andrew Benson - BBC Sport) Stephen, when this investment deal happens, will you still be involved and/or in charge? Is it a buy-in or a buy-out? Fitzpatrick: I'm not going to talk anything about the specifics. Q: (Dieter Rencken) To Toto specifically but if the others would like to join in please feel free. Toto, you've been on the strategy group since its inception basically. Do you honestly believe that it best serves Formula One's interests? At the latest one, for example, I believe the teams on either side of you put in certain proposals. These were blocked before they could even reach the Formula One commission so therefore they can't be voted on properly. Does this really work and is there an alternative to this because there's been an awful lot of criticism about the group? Wolff: You are a number one fan of the strategy group, we've found out. It is what it is. In Formula One, the difficulty is that every team has got to have an opinion and it is very much focused of course on your own performance but then we are responsible enough, within the group, to take into consideration what's good for Formula One and most recently I've seen a development that even within the very big rivals on the strategy group and in the F1 commission there is consensus and we're trying to seek consensus. Some of the things are not being accepted or not voted on. You refer to two specific proposals which, with all due respect to my friend Otmar, were on the agenda half a year ago. They were referred to the technical regulations meeting, so the competent group, not the dangerous group! The competent group decided that it was not the right way forward and for whatever reason these regulations appeared back on the agenda on the strategy group and this is why it was voted against, that is the fact. But that governance is in place until 2020 and if there is a possibility that we can improve it next time around in order to better the approval process, I'm the first one to vote in favour. Fitzpatrick: I never attended this strategy group. I have no idea what happens in the strategy group but I joked earlier on that Toto and Mercedes were winning too many races and maybe it's been a problem for him but really I know that the Mercedes team is a fantastic organisation and has earned these victories but the sport is not a level playing field, that's pretty obvious and the structure of the F1 commission and the F1 strategy group is part of that bigger picture. And I think the sport will be much improved and speaking now, as the eleventh placed team this weekend, I know that it's obviously what I will be saying but the sport will be much improved with a leveller playing field and how that comes about and all of the necessary components - whether financial, organisational, structurally - I think it's something that should be looked at for the benefit of everybody on the grid but it's a very complex picture. Q: (Jerome Pugmire - AP) Toto, there have been some stressful moments this season. If you were to give your podium of the top three between the first lap incident in Spain, the last lap in Austria and the engine failure for Lewis when he was about to win, which is the one-two-three for you? Wolff: You mean number one is the worst one? Shall we start from the back? Third place, for me, of the worst races is certainly Lewis's engine failure in Malaysia because it heavily influenced his championship. He was in the lead, solid in the lead in a race - in races - where it was going back and forth with Nico. Nico had a great race in Singapore which he dominated. Then Malaysia was very much Lewis's weekend and it continued that way in - what was the next one? - Suzuka, Mexico. So that's third place - and it came out of nowhere, really, so still a bit of a traumatic race. Number two? Barcelona. It's rare that you have a complete wipe-out, one and two in the front and you end up with zero points and for the team, obviously not a nice situation. We stood in front of the screens... I remember, I had the CEO of Daimler, Dieter Zetsche, next to me and he says 'what are we doing now?' which was a new experience. But it was OK because it didn't happen for a long time, since Spa 2014. So number one, for me, the worst, was Austria because it came a couple of races after Barcelona. We made it very clear that we saw Barcelona as a one-off and wasn't acceptable going forward and here we go, we're on the last lap of that particular race at the Red Bull-ring, home turf for our great rivals and we nearly lose both cars on the last lap, being in one and two. This is where, for me, the mark was over-stepped and we made that clear, but that was my winner. Not. Q: (Dan Knutson - Auto Action and Speed Sport) Monisha, Banco do Brasil announced today they will not sponsor Felipe next year. How much of an impact does that have on you deciding if he remains with the team? Kaltenborn: Well that's correct that the bank informed us as well that they've interrupted their 2017 sponsorship programme. Our seat is still open. We aren't choosing that in our assessments we're making and that's all there is to say of it. Q: (Dieter Rencken) On that vein, Toto, your driver Pascal Wehrlein, Mercedes driver, has basically only got one chance left for a seat next year. Could you see him actually racing in a car with a Ferrari engine? Wolff: It's two, two chances. Q: (Dieter Rencken) Yes, but then you'd have to provide a budget, wouldn't you? Wolff: First of all, I must say, really, having had the opportunity with Esteban and Pascal in Manor was great and the development slope of that team is impressive and it's a great place for both of them and Manor is still very much an opportunity for next year. Well obviously Esteban is going to Force India and we are in discussion with Monisha and in discussion with Stephen and his management group and nothing is decided yet. That's where we are. Q: (Andrea Cremonesi - La Gazzetta dello Sport) Toto, do you think that at this moment Lewis Hamilton fully trusts your team or if not are you doing something to rebuild the relationship? Wolff: Absolutely trusts. We under-estimate the pressure under which these guys are, not only in the spotlight of a global audience. You have to deliver every single weekend, you have to race your teammate, it's down to the last race to win the championship and it's all coming up, all the frustrations and all the happy moments. If a microphone is being put under the nose and you're being asked the right question, sometimes it produces a good headline like it did yesterday. For me, it's a bit of a boomerang which keeps coming back, this odd story which internally in the team is a closed chapter and we will not come back to this so it doesn't change anything in my approach to Lewis or an approach towards Lewis because I think it's well understood that things are sometimes taken out of context, sometimes over-exaggerated and as I said before, sometimes you just need to allow that the drivers can express their feelings and their emotions. We don't want to streamline them too much. Q: (Ysef Harding) Claire and Monisha, we've seen a lot of history for women this year. We saw the second female prime minister elected and we also saw the first female elected for president of the United States. As two pioneers in this sport, what are your hopes for the future for women on the business side and on the track in F1? Williams: That's a nice question! I think what you see across probably a wide variety of industries in recent years and particularly what you see in the UK with Theresa May coming in as our first female prime minister for - what is it? - three decades I think, that the landscape is shifting slowly but surely. I think there is a lot of work to do but personally - I don't know what Monisha does - but I go out and do a lot of talks about women in industry and promoting females in not just leadership roles but throughout different sorts of organisations and I think that's really important and I think one of the things about Formula One that you don't necessarily... yes, you see Monisha and I in the roles that we're in but there are so many women now who are working across different areas within Formula One, across different disciplines within teams, whether that be in aerodynamics, within engineering, not just the traditional marketing roles and I think that's a really important shift that we're seeing in our sport and I think that that can be used as case studies and great story telling, to go out into different businesses because I think if you can be a woman and do well in Formula One. I think that's a very powerful message but personally for me, it's not necessarily about gender and it shouldn't be about gender I think. But every individual brings different personalities to the roles that they do and particularly in a sport like this, where you have to operate at your peak performance if you're going to be successful and achieve and that's what every team is going after, it's the people who are at the best at their jobs. If they're going to win in this sport then it shouldn't necessarily be about gender, it should be about how good you are at your job and how committed and dedicated and what you can do, the team around you. But I would like to see more women come in to Formula One and I would like to see more women come into industry as a whole. I think it's a really important conversation that we're having in society as a whole at the moment. Kaltenborn: Yeah, like Claire said, you see that there are far more women in Formula One. It's been happening over the last few years, actually, where you simply see more on the track. I think the most important responsibility we have here is to actually encourage people to give women the opportunity, because that's what it's about. You have enough women out there who have the education, who have the competence and the confidence to actually get the job done at least equally as good and usually they have to be a little bit better to maybe get the same kind of recognition, so what you really need is to give women a fair chance and opportunity. Q: And it was a woman in charge of strategy in your team who played a part in bringing you the points in Brazil, right? Kaltenborn: Absolutely. We gave one a chance.